Includes: Headbord, Footboard, Storage Rails. Jackson Lodge is a stunning combination of rustic and relaxed style – a unique and welcome addition to any bedroom. 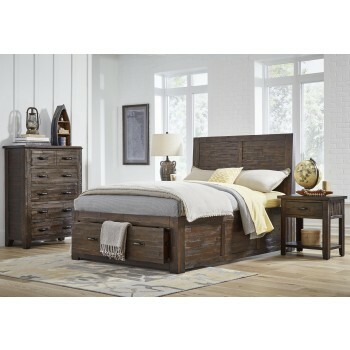 Its rich stain, tasteful distressing, and solid wood construction are eye-catching and its multiple bed and case piece options make this group a can’t-miss bedroom solution.